Italian auteur Luca Guadagnino completes a trilogy dedicated to human desire with ‘Call Me by Your Name.’ The follow-up of ‘I Am Love’ and ‘A Bigger Splash’ is arguably the best of the three. 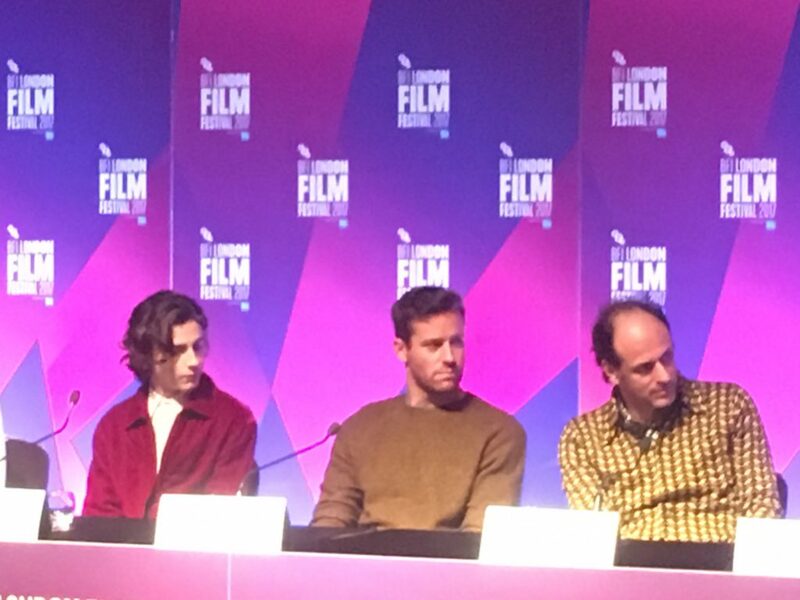 A tender, finely observed gay tale of first love between Elio, the son of an Archaeology professor- a revelation-like performance by Timothée Chalamet- and Oliver, the doctorate student who comes to help the academic with his research and archives, played by Armie Hammer. Both leads initially rejected the roles, but the director convinced them to take the challenge. Like the rest of his work, this romance is imbued in sun-bathed Mediterranean sensuality, social gatherings over food and the everyday summer activities typical of a town like Crema, part of the Italian Lombardy region, which provides a strong sense of place that becomes instrumental to the development of the story. The cast during the press conference recalled the memorable immersive experience that preparing for the role for weeks in such great location turned out to be. Based on a memoir by American writer André Aciman, named after a sort of intimate ritual the two lovers made up to give a sense of uniqueness to their relationship. The arrival of the American student is first met with suspicion. His in your face, direct attitude is initially perceived as arrogant. Elio describes him as “The usurper,” as Oliver takes his room during his stay. The teenager’s old and new rooms, though, share a bathroom whose communicating doors would become instrumental in the different stages of their relationship. His first impression shortly gives way to an increasing mix of fascination and jealousy. As the good looking foreigner shortly catches the attention of many of the town’s girls, Elio begins to reluctantly accept the advances of Marzia. The couple begins an erratic and short-lived fling, a reaction against his, apparently, unrequited attraction for Oliver. But the lazy summer days and their pleasant nights play their part bringing the two together, despite the scholar’s worries about how inappropriate this situation may be, soon the audience is engaged in the will they/will they not situation. 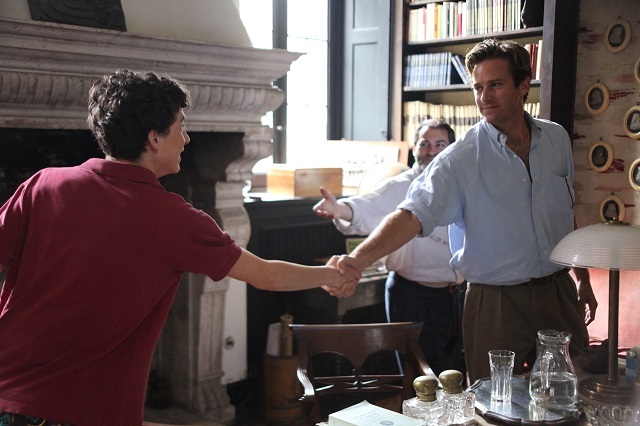 As the work of a big cinephile, ‘Call Me By Your Name’ is packed with other film’s references, perhaps the most notable of which is when Marzia, performed by Esthér Garrel, at the make-up moment with Elio, uses some dialogue from the work of his dad, the acclaimed French filmmaker Philippe Garrel. 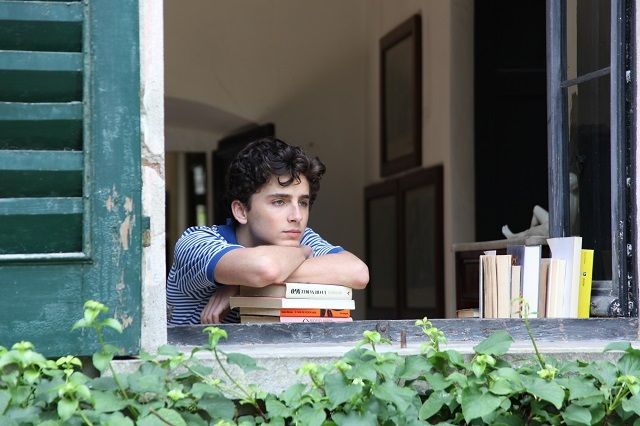 The film is also crammed with artistic references from other disciplines, a book of poems by Antonia Pozzi; discussions about Bach; the German translations of Elio’s mother or the classic sculptures found by the professor are subjects of very distinctive scenes. But above them all the role of music stands out. Sufjan Stevens wrote two new songs and reworked an old one, Futile Devices, for the soundtrack. Guadagnino felt that the film needed to be emotionally enveloped in something, and the music of Stevens would perfectly suit that role. He praises the great depth with which the American songwriter has used his most intimate personal and familiar stories to write works of the calibre of ‘Carrie and Lowell’, our best album of the year in 2015. Elsewhere, The Psychedelic Furs are played and talked about, alongside a well chosen batch of 1983 summer Eurohits by Battiatto, Joe Esposito o FR. David, among others contributing to the life-affirming atmosphere. The recent twitter feud between Hammer and James Woods, who accused the film of indecency, creating a bit of scandal, was also mentioned. The Italian auteur answered he did not see the film as challenging or scandalous, comparing it to past film scandals such as Godard’s ‘Je vous salue Marie’ or Scorsese’s ‘Last Temptation of Christ.’ Actor and director affirmed the veteran Hollywood star had not even seen the film and encouraged him to do so. Guadagnino declared how much he admires Woods as an actor and affirmed he would be happy if the film in any way helps challenging prejudice and regressive attitudes about these matters. Perhaps this is the reason why the sexual scenes are rather non explicit. When asked for it, he joked that in his former film Ralph Fiennes spent most of the time naked next to the swimming pool and that had fulfilled his desire for explicitness for many films to come. In other standout moments of the press conference, the director defined himself as neither an Italian nor a Hollywood director, as he doesn’t work in either of those film industries; Talked about the work of Hirokazu Kore-Eda. Mentioned Hou Hsiao-Hsien as a common influence when the film was compared with last year’s Oscar winner ‘Moonlight’ and quoted Prefab Sprout’s song ‘All the World Loves Lovers’ as a perfect summary for the film’s philosophy. This entry was posted on October 11, 2017, 12:00 am and is filed under POP CULTURE & NEWS, POP CULTURE & NEWS. You can follow any responses to this entry through RSS 2.0. You can leave a response, or trackback from your own site.